Cost Inflation Index – Meaning And Index From 1981-82 to 2016-17: It has the meaning of Cost Inflation Index (CII) which is used for Computation of Long Term Capital Gain. Cost Inflation Index are Notified by CBDT every year and till date CBDT has notified Cost Inflation Index for the Financial Year 1981-82 to Financial year 2016-17. 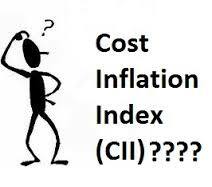 Cost Inflation Index are used for computing indexed cost of acquisition. It is a measure of inflation that finds application in tax law, when computing long-term capital gains on sale of assets. Section 48 of the Income-Tax Act defines the index as what is notified by the Central Government every year, having regard to 75 per cent of average rise in the consumer price index (CPI) for urban non-manual employees for the immediately preceding previous year. Therefore, if we consider that price of a capital asset has risen in tandem with base price rise, then if one want to sell an asset and replace it, the cost allowed even after indexation will be lesser than the price payable for new asset. However, in case of many capital asset the price rise is lesser than market price and in many cases it is higher. How does CII help in capital gains computation? Capital gain, as you know, arises when the net sale consideration of a capital asset is more than the cost. Since “cost of acquisition” is historical, the concept of indexed cost allows the taxpayer to factor in the impact of inflation on cost. Consequently, a lower amount of capital gains gets to be taxed than if historical cost had been considered in the computations. Formula for computing indexed cost is (Index for the year of sale/ Index in the year of acquisition) x cost. For example, if a property purchased in 1991-92 for Rs 20 lakh were to be sold in A.Y. 2009 -10 for Rs 80 lakh, indexed cost = (582/199) x 20 = Rs 58.49 lakh. And the long-term capital gains would be Rs 21.51, that is Rs 80 lakh minus Rs 58.49 lakh.